Bill O’Reilly recently thought he had liberals pinned in their remorseless war on Christmas: the namby-pamby secular humanists who insist on saying “Happy holidays” so as not to offend people of other faiths had no ground to stand on this year. Hanukkah coincided with Thanksgiving in 2013, meaning “There are no other holidays between Thanksgiving and Christmas this year,” O’Reilly snorted. Thus, there are no grounds to say “Happy Holidays” in December. There is only one holiday, the mac-daddy of all holidays, the reigning champ—Christmas—and every right-thinking American has to say “Merry Christmas,” or else. Elsewhere on Fox News, Sarah Palin was squawking about how much she loves the commercialization of Christmas—“obviously the jolliest of all holidays,” she said with her inimitable way of laying emphasis in all the worst places. If all this frantic defense of something not in need of defending smacks you as the voice of some kind of neurotic insecurity—Christmas is really the best, guys!—you wouldn’t be alone. The War on Christmas has been the right-wing’s reliable holiday hobby horse for years now. Can America remember a time before the War on Christmas? It seems to be an expression of the cultural siege-mentality of a certain slice of America in the age of Obama, but perhaps it has a longer history. Here the plot of every holiday movie and sitcom about a parent frantically seeking the must-have toy of the season on the final days of shopping finds its ne plus ultra. Tickle-Me Elmo is not worth fighting over—the violence must stop. And Frank Costanza had a vision. Thus was born Festivus, the fake holiday introduced to the world by “The Strike,” one of the finest of late-era Seinfeld episodes. Few may realize that this episode not only featured the Feats of Strength and the Airing of Grievances, but also several other classic Seinfeld subplots (Elaine seeking her 10th free hoagie; Elaine giving out a fake number to “Denim Vest”; Kramer’s decade-long strike against the bagel shop; a girlfriend who looks pretty in some lights and homely in others). It all begins because George is annoyed that a coworker’s “gift” to him was a donation to some sort of nonprofit children’s fund. (“What happened to the Christmas spirit? !” he demands to know. “An eye for an eye!”) So George decides to hand out bogus certificates for a donation to something called the Human Fund, which his officemates greet with predictable indifference. The only hitch is that George’s boss, Kruger, wants the company to “throw some money” at a good cause and he picks the Human Fund because, who cares, really? George, of course, gets caught in his lie. With his back against the wall, he reverts to a posture of righteous indignation, saying that he could not in good conscience buy his coworkers Christmas gifts because his family does not celebrate Christmas, but Festivus. They were persecuted for their beliefs—“They drove us out of Bayside!” Kruger, of course, wants evidence of George’s idiosyncratic faith, and so he more or less invites himself over to the Costanza family’s December 23rd holiday dinner of horrors. In some ways, the episode lampoons PC multiculturalism. Kruger visits the insufferable Costanzas and says he finds their culture “fascinating,” as if he were an anthropologist in Borneo. (Though, to be fair, almost anything in Borneo makes a lot more sense than the Queens couple.) Earlier in the episode, Jerry and Elaine are at a Hanukkah party thrown by the vacuous dentist Tim Whatley (Bryan Cranston), who has converted to Judaism, Jerry suspects, “for the jokes.” Whatley’s Jewishness seems about as real and sincere as Martin Lawrence’s make-up in Big Momma’s House, but Jerry and Elaine have to treat his so-called faith with at least superficial respect. Then again, for all the shade he throws at Whatley for his pseudo-Jewishness, Jerry seldom demonstrated even a passing interest in actually attending service or participating in Jewish religious life. (The notorious Schindler’s List episode played up Jerry’s credentials as a bad Jew.) Yet, for this lapsed Catholic who attended 12 years of Catholic school and went to Church twice a week until my twenties, there’s nothing better than tossing off the “I grew up in it, so I don’t have to be in it now” attitude. Whatley may be fake, but Jerry has been “faking” it for some time. Indeed, a major theme running through the episode is fakeness—George invents a fake nonprofit, Frank invents a fake holiday, Elaine gives out fake phone numbers, and Tim is a fake Jew. (Even Kramer’s strike could be considered fake, and its “resolution” was certainly not real; he only got his “demands” because the federal minimum wage was raised.) All of these ruses serve to manipulate others and aggrandize the faker in one way or another—except, perhaps, for Festivus, which seems to be a real expression of Frank’s endless eccentricity. Let’s face it: as a million Buzzfeed lists will tell you in upcoming weeks, we all have strategies to “survive the holidays,” family being the main obstacle to be overcome. We all worry about facing an Airing of Grievances around the Christmas/Hanukkah/Thanksgiving dinner table. “I got a lot of problems with you people!” exclaims Frank, ushering in Festivus ‘97. “Now you’re going to hear about it!” Frank’s approach, harrowing, insensitive, and insane as it might be, remains honest in a disturbing way—the kind of honesty that melts batteries. Then again, maybe Frank’s Festivus is less about community than it is a strike against Christmas and Hanukkah, a kind of inchoate “cry in the night,” as historians of the 1960s and 1970s love to describe that era’s dissidents and radicals. The physical brutality of beating another man over a Cabbage Patch doll is simply transmuted into terrorizing your family with the blunt honesty of your views about them. Few things are more American than a guy turning his bruised sense of masculinity and male pride—ravaged by deindustrialization, Google, and kids who use Snapchat—in toward his own family. Indeed, “The Strike” gives us deeper insight into George, a man who apparently knows what banishment from Bayside, Queens means in real terms and was nurtured on the curdled but honest love of Festivus. “Festivus is your heritage,” Frank implores George. “It’s part of who you are.” Undoubtedly, the holiday provides one more page in the epic novel that explains George’s various neuroses. In the end, the Janus-faced nature of the holidays even affects the more prosaic Jerry, who meets his new squeeze at Whatley’s Hanukkah shindig. His new girlfriend, Gwen, looks stunning one moment but brutally haggard the next, depending on the lighting (though, to be fair, TV ugly is still pretty attractive). Dates with his new lady become a shell game where the only options are “the good, the bad, and the ugly.” It ultimately takes a “Festivus miracle,” the second of the evening, to bust this pair of young lovers up. 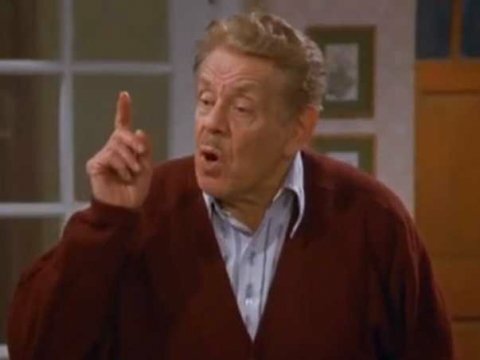 “Until you pin me, George, Festivus is not over,” Frank warns his son in the episode’s waning moments. Kramer, the original volunteer for the Feats of Strength, has ended his fake strike and absconds from Festivus at the critical moment to work real bagel-producing hours. Gwen believes Elaine to be the “ugly” girlfriend on the side she’d heart about and leaves Jerry, who can muster up only so much energy to pursue her: “Bad lighting on the porch,” he mutters, returning to the festivities. Even Gwen is not a real beauty—her attractiveness depends on the light. Elaine’s fake number results in her losing a real shot at that free sub. 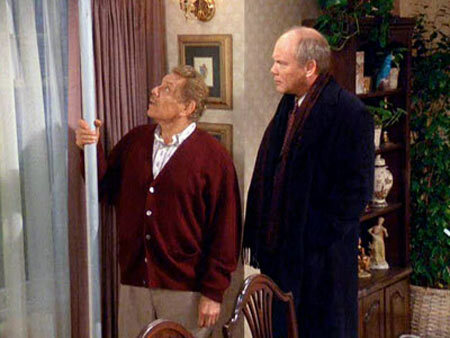 In the end, the only thing real is Festivus—just ask George. Festivus won the War on Christmas before a single shot was fired.